Fall normally means change. It's halfway through the school year, it's family and holidays, and it's the beginning of the new year. There is so much excitement swirling around, it's hardly easy even to stay still. What's worse is that with the cooler weather blowing in, in some places it's too cold, wet, or both to even go outside and enjoy it all. As in my article Fun Activities for Your Kids When It's Too Cold to Go Outside, I try to take full advantage of not only the weather outside, but the wonderful holiday excitement all around, by filling my time with fun activities, fun crafts, and in my case, fun articles. 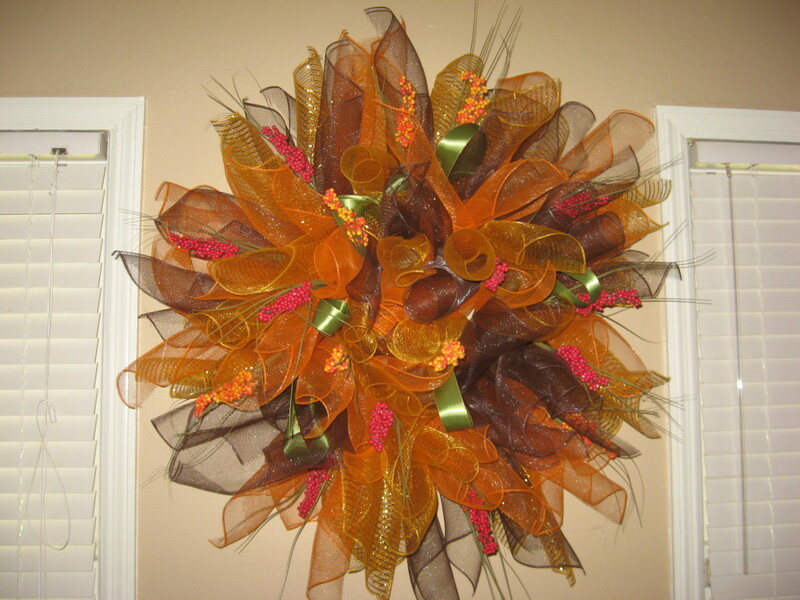 This is the perfect time for making turkeys, scarecrows, fall leaf creations, and beautiful centerpieces to decorate my home for the fall. I really believe that both you and all of your children will have a blast putting together some of these fun fall crafts! I hope you enjoy them! These are adorable for hanging on the walls or on the refrigerator! 1. Start with a fresh, clean piece of paper, and prepare your paints on different paper plates for your kids by putting a pool of brown for the tree trunk on one plate, and small pools of other fall colors on other plate for the leaves. 2. You may need to help your little one(s) to smash their hands down into the brown paint, and press them onto their pieces of paper for the tree trunks. 3. They should probably go and wash their hands after this part. 4. 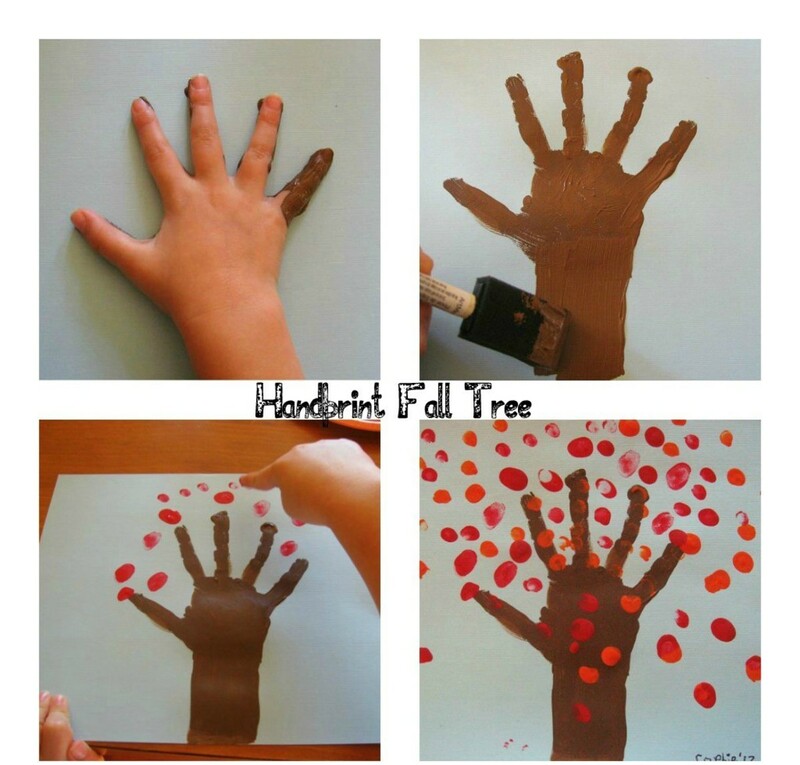 Now they can use their fingers to create the different colors of leaves all over and through their "tree branches." 5. If it helps, you might want to create one to start with (or create one with them), so they can get the general idea but still be able to use their imaginations. 6. Wash hands well after the activity. Dry thoroughly before hanging or displaying. Make sure they sign their work so they can show it off to others, and give you a keepsake for the future. Hang this above a crib, above a child's bed, or even above the dining table for your Thanksgiving dinner. 1. You will want to begin by setting out all of your materials and creating the frame for your mobile. 2. You can either let your children have at it themselves with little direction, or you can give them an example and prepare their materials for them ahead of time. 3. I do suggest starting this activity by taking your kids on a nature walk and allowing them to choose their own mobile items. 4. To create a frame, cut a length of string about a foot and a half long. 5. You will want to tie a loop on one side for hanging and tying the other end to the center of a sturdy stick. 6. Cut two more lengths of string, about one foot long, and tie them to each end of the original stick. 7. Tie the other end of each string to the center of a new stick. 8. Cut one piece of string about two feet long and tie one end to the center of the original stick. 9. Continue this process with your other sticks. Your mobile can be as big or as long as you would like it to be. 10. Heat your glue gun, and make sure to supervise it's use for older children, and do this part yourself with younger children. 11. You will want to glue each of your natural items along each of our strings so that they hang down from your sticks. 12. When finished, tie a ball weight to the end of each of your strings to keep the mobile long and straight when hanging. Not only is this a fun holiday tradition that I love to do every year, but these make for beautiful displays to frame and hang on your walls. 1. This is one of those activities that each of us likely experienced in grade school, but it can still be fun as an adults. 2. 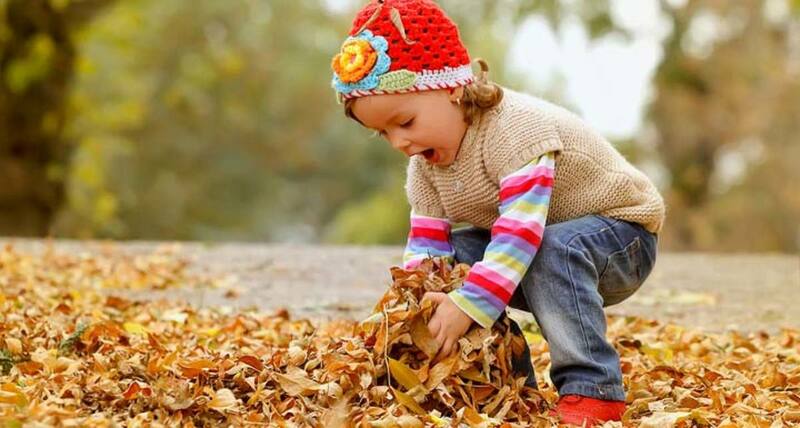 Take your kids on a refreshing nature walk, preferably when it's dry and not too cold outside, to pick up a variety of beautiful leaves for your rubbings. 3. To begin this activity, you would have your kids either lay one leaf at a time, or a collection of leaves, on the table, place their papers over the top and rub with their chosen colored crayons. 4. I suggest rubbing one leaf at a time so that you can color each leaf with a different color. 5. 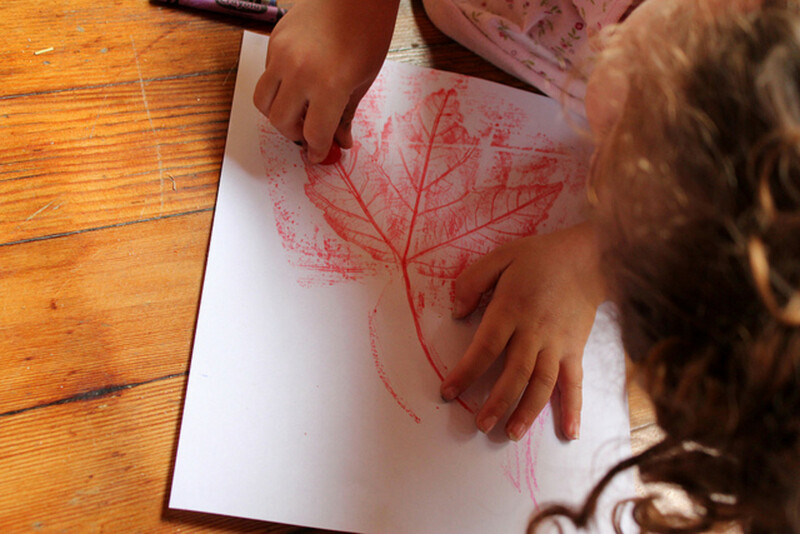 To create "rubbings" without destroying your leaves, you will want to remove the crayon wrappers, lay the crayons on their sides on the paper, and rub gently over each leaf until the texture of the leaf begins to appear. 6. Encourage your kids to be creative. I would frame them afterward for displaying on the walls. Display your kids' amazing creations for all the neighborhood to see. These beautiful stained glass creations will surely capture attention and amaze! 1. 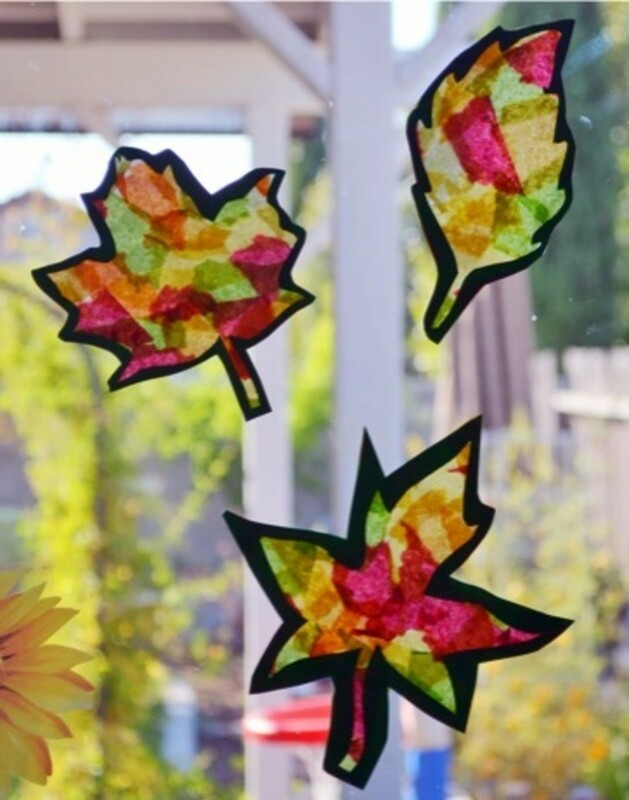 You will need two black leaf shapes for each stained glass leaf you want to make. 2. I would begin by tracing or free drawing a leaf or two, folding your construction paper in half so that you can still see your pencil marks, and cutting out two leaves at a time. 3. You will then gently fold over one of your leaves and cut a slit in the middle by which to insert your scissors. Then cut another leaf shape out of the middle of the first leaving at least an inch to a half inch around the border to glue your two leaf shapes together. 4. 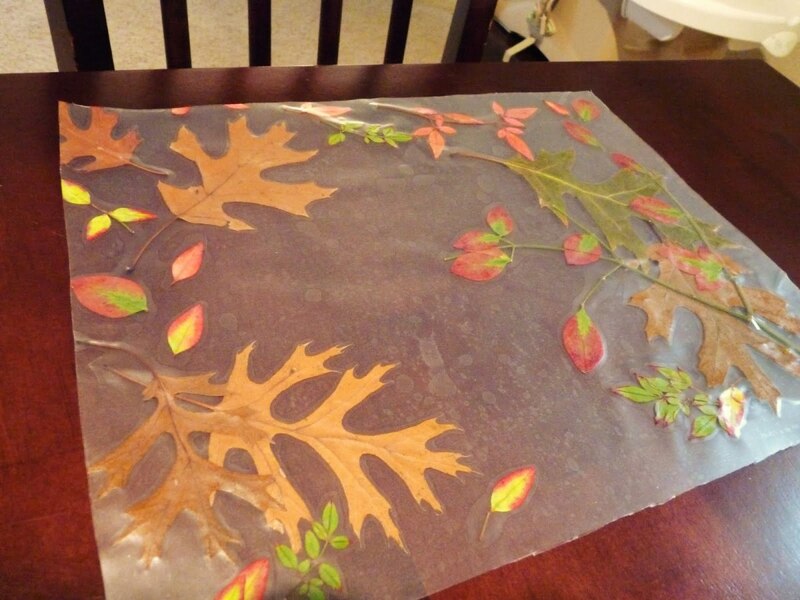 To get the same shape out of the middle of your other leaf (the second part of your first stained glass leaf), place them on top of each other and trace your cutout onto the second piece. This way you can make sure to cut exactly the same shape out of your second leaf. 5. In the meantime, tear your chosen colors of tissue paper into small pieces. 6. Glue them together using your glue stick, overlapping the edges just a little to give them something to stick to, making a shape the size of your leaf pattern. 7. When finished, glue your tissue paper down to one piece of your leaf, making sure that the tissue paper at least reaches the black shape, but isn't bigger than the leaf. You made need to cut or tear the tissue paper to fit inside the black paper. 8. Glue the second leaf piece on top of the first, covering the torn edges of your tissue paper. 9. If you choose, you may punch a hole in the top of your leaf and hang it with string. Celebrate in fall in one of the best ways, by acknowledging all of the animals that come out in the Autumn. You might even be able to go animal watching and take pictures of some of the animals you see so you and your kids can reproduce them on fall leaves. 1. Gather leaves from outside. They need not be all brown, but could always be green, yellow, orange, red, or maroon. The fall offers such a bounty of colors to choose from. 2. This variety of colors also makes it easy to let the imagination go when designing animals on them. An orange leaf could easily be a fox, a brown one a bear, etc. 3. Once you have gathered your leaves and have made it home, it's time to decorate them. 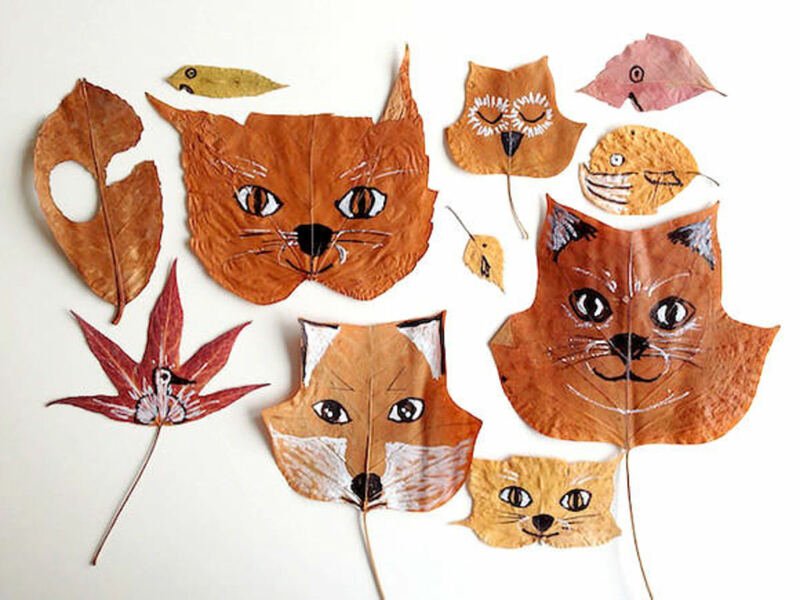 You might want to look at pictures of animals as you recreate them on your leaves. 4. If you want to go all out, spend the fall and winter months animal watching and taking pictures of interesting animals in your area to draw on your leaves. 5. Using colored pencils, or even thin paint pens or small paint brushes, draw the different animals on your leaves which can then be displayed in a mobile, framed for the wall, or inserted in beautiful fall place mats. Enjoy! What a great way to make a beautiful wreath for your front door and share with all of your visitors all that you and your family are thankful for! 1. Cut a bunch of leaf shapes out of your colored construction paper. 2. Glue the edges of your leaves together in the shape of a circle, overlapping just slightly so that there is still plenty of room to write your blessings on each leaf. 3. Encourage your children to think about what they are thankful for. You may even want to suggest some things you are thankful for. Check out my article on Teaching Your Children to Be Thankful for some great ideas! 4. Write one blessing on each leaf. Your little one(s) may want to complete their own wreaths, or you could collectively, as a family, write what you're thankful for on the leaves (you may want a bigger wreath to do this). 5. Glue your string or twine around the circle of your leaves, leaving enough of either end above your wreath to tie it into a bow to hang on your door. 6. If you choose, decorate your wreath with more string/twine or with some ribbon. Enjoy! For just pennies on the dollar, you could have beautiful place mats for every guest at your Thanksgiving dinner. 1.This one is super easy and fun! And these turn out so nice! 2. 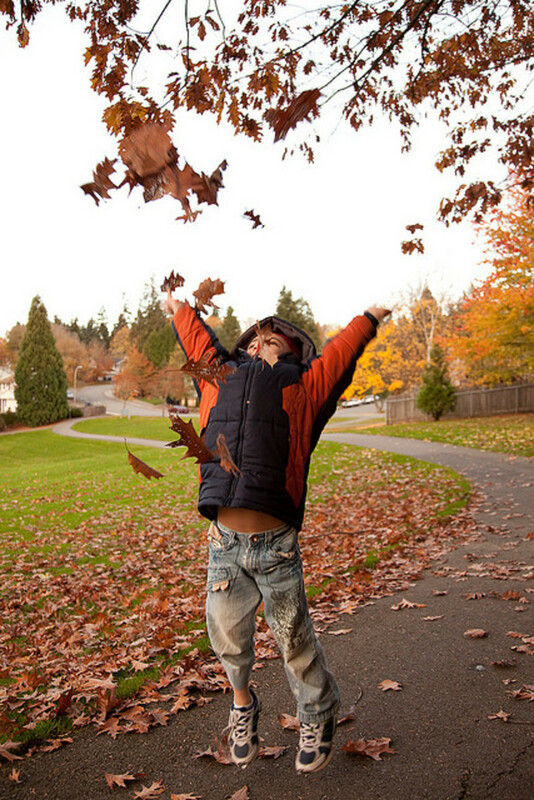 Begin with a nature walk to gather some beautiful fall leaves. 3. Once at home, cut two pieces of contact paper the same size, of an appropriate size for your place mats. 4. Lay one paper flat on your table and take the paper off (leaving the sticky side showing). 6. Next, peel back a little bit of the paper on one side of your second piece of contact paper. The trick is only revealing a little bit of the sticky part on the second piece of paper at a time. 7. Match up the edges, sticky side to sticky side, on both pieces of paper and smooth down flat to remove any bubbles. 8. Continue revealing a little more sticky paper and pressing both sides together flat, pushing out any bubbles until you are all the way to the edge. 9. If for some reason it didn't lay down straight and there is sticky paper showing on one side or the other, simply cut it off, making sure to keep your place mat edges nice and straight. 10. If done correctly, you should have a nice seal between both pieces of paper, sealing the beautiful leaves you collected inside, without any air bubbles. These are going to be gorgeous on your Thanksgiving table. How proud will your children be when they can tell everyone that they made the fall centerpieces for your Thanksgiving dinner? 1. Your kids are really going to enjoy this project! 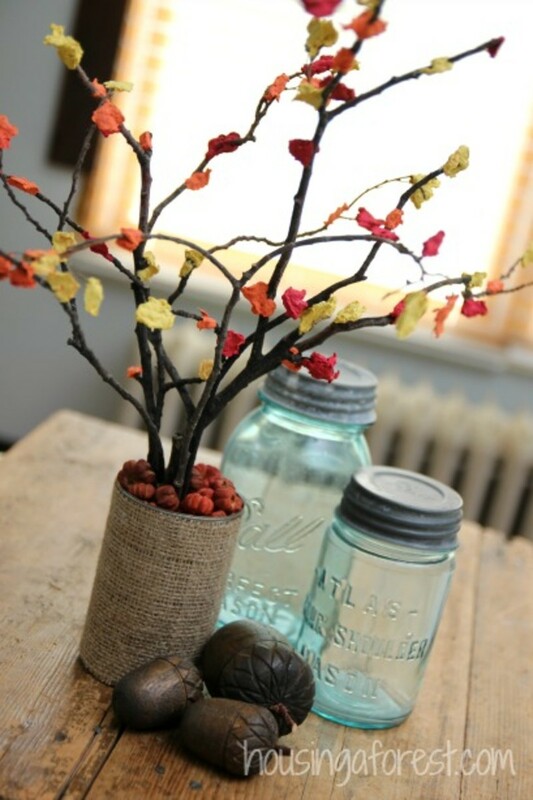 You can choose to use clear jars to fill, or cover the jars with lace or twine instead. In this activity, I'm going to guide you in covering your can or jar with twine. 2. Begin with a clear jar or can. Put a line of glue all the way around the top rim of your can or jar. Lay your twine down, going all the way around the can laying it in the glue. 3. Hold the end of your twine down while you draw another line of glue all the way around your can next to the first row of twine. 4. Keep twisting your twine around your can covering the glue you are laying down. 5. Once you get about halfway down your can with twine, or the glue dries under the end you're holding, you can let go of the end of the twine. 6. Keep lining your can with glue and twisting your twine around your can until the entire can (or jar) is covered in twine. Cut the end and make sure it is glued down. 7. The benefit of using a twine covered can is that you can fill the bottom with newspaper rather than finding enough nuts or berries to fill the entire jar. 8. Stuff your sticks down into the newspaper (or berries) until they look as you wish. 9. Glue nuts or berries into the top between the top of the newspaper and the top of your can or jar. This will keep them from falling out while moving your centerpiece, and will hold your sticks exactly where you want them. 10. Finally, tear off pieces of tissue paper in the color of your choice, ball it up, dab a little bit of glue inside and press it onto your sticks where you want them to look like leaves. The glue will melt the paper a little, allowing you to essentially smash it into place on your "tree." 11. Do this will all of your paper until your tree is sufficiently covered and voila! 12. Allow it to dry thoroughly before using. These will look great on your dining table for dinner! Crafts are so much fun either as family projects where you all work together, or for your ids to work on alone. 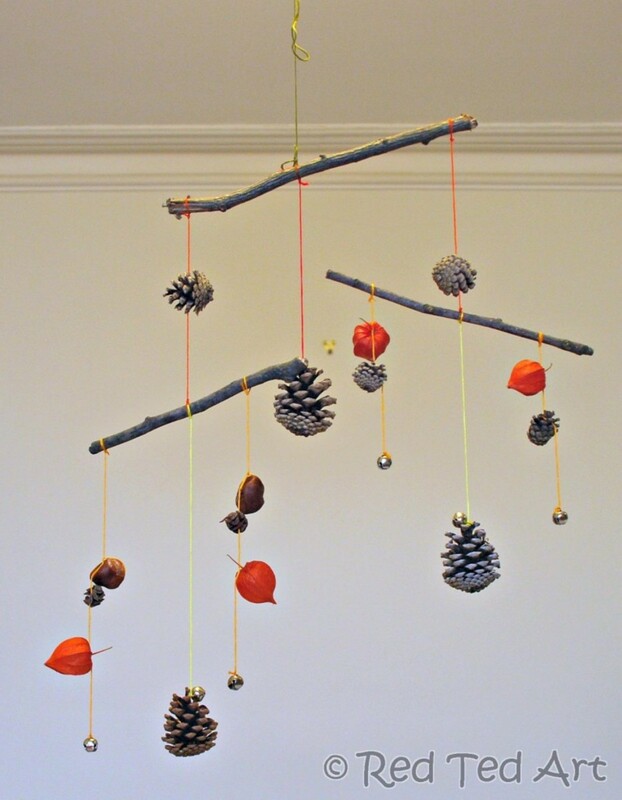 Kids love it when they get to create something beautiful, especially if you use it in your home, and display it for everyone to see. They take great pride in a job well done, will be delighted to show their work off to friends and family, and it will help you to decorate for family coming over. Although crafts are great for any time of the year, it's especially fun to do something different and unique around the holidays. It tells your kids that somethings changing, something exciting is about to happen, and is the perfect way to celebrate! Very helpful! I found a lot of new ideas for my kids! Helpful! I found a few new ideas for my kids! Not very helpful. I didn't find anything new that I haven't already seen. Lovely crafts...thanks for sharing. It is so much fun to do these activities with children. Even though they are so steeped in all things technology there are few who do not enjoy these. Eric, Thanks! I love the fall and everything about it. This is definitely my favorite time of year! Got the leaves. Too many turkeys made of handprints. We will move on and have fun. Thanks my daughter and I will make your ideas real for my youngest. Good job and thank you. I still think that itchy unders after playing in the leaves is the best. We have too much fun!! !